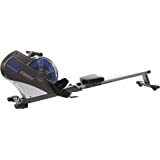 Amazon's Choice for "stamina rowing machine"
Full-motion arms on the Stamina BodyTrac Glider simulate the feel of rowing on actual water. 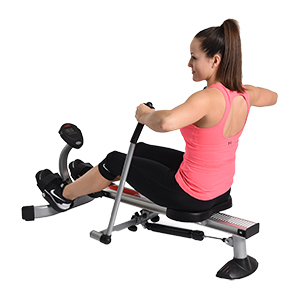 The unique design allows for a full-body, effective workout for every major muscle group - including back, legs, arms, abs and glutes. 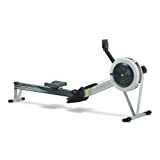 Rowing is also widely known to aid in improving cardiovascular health and burning calories. 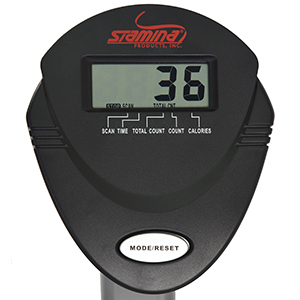 Stay focused during exercise with an easy-to-read LCD monitor and see your workout time, stroke count, calories burned and total strokes accumulated. 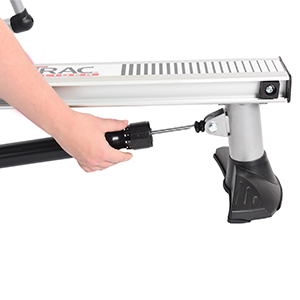 When you want to increase or decrease the intensity of your stroke, simply adjust the hydraulic cylinder. 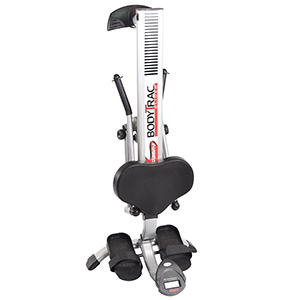 For extra support and stability, the BodyTrac Glider moves along a smooth ball-bearing roller system and includes features to enhance your comfort, including textured foot plates with straps, a molded seat and padded hand grips. Fold the arms after you've completed your workout for an easy way to save space. 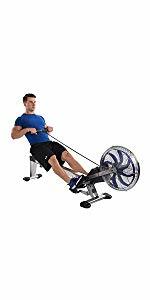 The natural range of motion offered by the rowing arms mimics the feel of rowing in actual water. Changing your desired intensity is easy with the hydraulic cylinder. The textured surface offers increased stability. 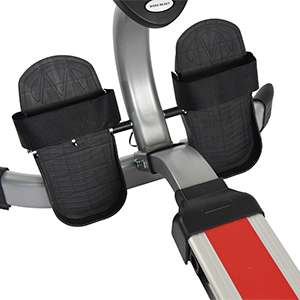 Adjustable nylon straps make the plates ideal for nearly all feet sizes. 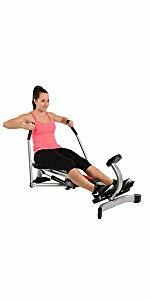 The ergonomic, molded seat offers comfort during workout sessions of all lengths. Save your space by folding the arms after exercise. 250 lbs. 250 lbs. 250 lbs. 250 lbs. 300 lbs. 300 lbs. As with any exercise program, consult your physician before you begin. 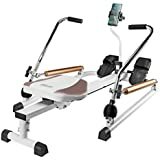 Great machine for the price. I too had the problem with my shoes slipping out of the foot straps. The back rim isn't tall enough. However, for about $1 you can mod the peddles for a quick fix. 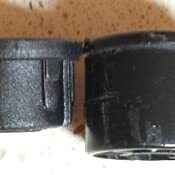 I cut a 4" PVC end cap in half and bolted them to the peddles as shown in the attached photo. Works great and fits my big shoes. 4.0 out of 5 starsGood machine WHEN it works. 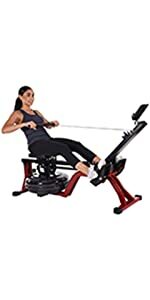 The good: this rower replicates an actual rowing experience pretty well, which I like because I rowed in my college days. 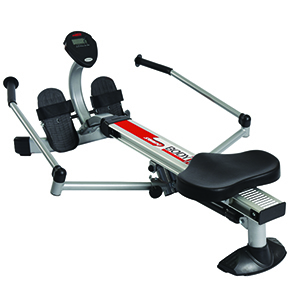 It has a minimal foot print and works well even after 10 years (I didn't row for some of those years). 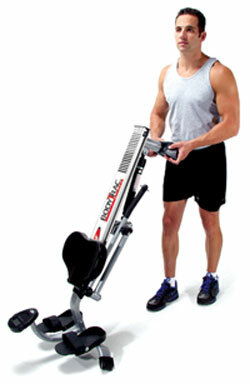 Neutral: I use it at a medium setting, I use it more as a heart pumping exerciser than a strength building exerciser. 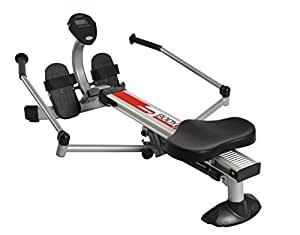 Given it has only one piston, and the pivoting mechanisms are a bit fragile, I don't think it's meant for really strong people or people who enjoy working with high resistance. 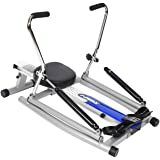 I read one review where the person broke the main pivoting bolt, and some reviews where plastic bushing shavings appeared after work-outs. The bad: There are two problems with this machine, both of which you can work-around. 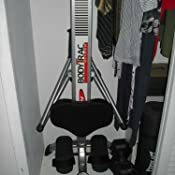 The lesser problem is the foot straps, only one pair of shoes I own works well with the straps such that my feet stay in the foot rests. 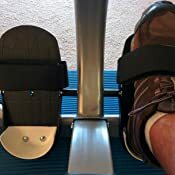 The company that makes this machine apparently has another different pair of foot rests/straps, which probably allow you to exercise with another pair of shoes that work. The biggest problem is the pivoting mechanism under the machine which has PLASTIC bushings. Those bushings WILL wear out, either fast when you're strong and work with high resistance, or over time. 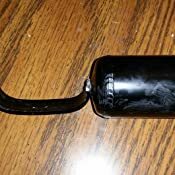 The company should have used metal bushings, but that would have increased the price by a few dollars and would make the product last too long. You can order new bushings, and when they arrive you'll find out they are the wrong ones and they don't fit and you can't put the machine back together. This is the end of the machine for the average person. If you have access to a grinder, you can grind down the bushing 1/32 of an inch and then you can put the pivoting mechanism back together. The company refuses to acknowledge they sent me the wrong bushings, twice, and refuses to admit the new bushings don't work. The picture, if you can see it, has the old bushing on the right, the new bushing on the left, obviously not the same bushings. 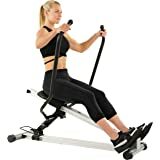 Conclusion: great machine for people in reasonable shape WHEN it works. Foot rests require you to find shoes that work. Pivoting bushings wear out and you need a grinder to make new bushings work. 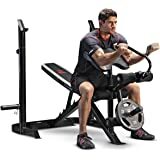 Not a good machine for strong people. Product support is helpful at first but bails at the first sign of trouble. 4.0 out of 5 starsExcellent Purchase. Highly recommend it. 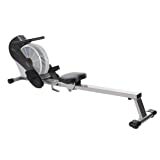 I wanted to buy a rower because I had used one years ago at the gym and liked the way it worked. All the other machines either were too highly priced, or the reviews were not too convincing. 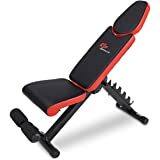 The price on this one was very good and the reviews were good. So I gave it a try. 1st it was very well packed. 2nd it was very easy to assemble. have no problem hearing the movie sound. 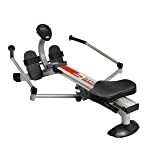 4th and most important, it is a great workout...I've had it for just under a month. Use it everyday. Initially for 15 minutes. Now up to 50 minutes. I started at level 1, that was easy. Progressed to now level 6. Works up a good sweat and my wife can see the difference. My arms are more shapely and a little bigger. And I've lost some belly fat. As far as weight loss. I have lost about 4 lbs. I think the main difference is that these workouts mainly help turn fat into muscle. I am very glad I chose this Stamina Body Trac Glider 1050 Rower. PS... I will add a video at a later date. 1 pedals kept slipping off. This is very easily, quickly and inexpensively corrected by buying a set of 2 Velcro strips, which I found at Lowe's for under $7 a pair. Feet have not slipped off the pedals since. 2 due to the motion, I have a little bit of friction burn on my rear. 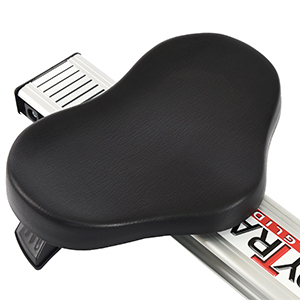 I had an extre sheet of rubber floor padding left so I cut a piece to the shape of the seat, and it did relieve some of the burn. 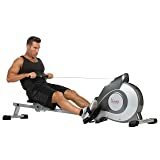 This rower is an Excellent buy. As the pros outweigh the cons. I would have given a 5 star if it would have come with 4 Velcro strips instead of 2. And if the seat were padded better. It is still by far one of the best, if not the best purchase I have made in the last 5 years. I'm up to level 8. Doing 20 minutes a day. I have lost weight, toned down & feel great. That being said, you should incorporate, a healthy diet, some calisthenics, and you should workout regularly. 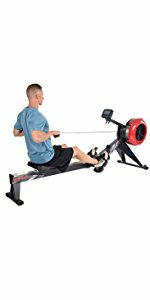 I try to use the rower at least once a day. Though I miss days here and there. Every so often you should lubricate with WD40. Also, I suggest you go over the machine (bolts, screws) and make sure they are staying tight. I do it at the end of each month. 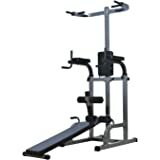 Due to movement and vibration, some may loosen although it is minimal. 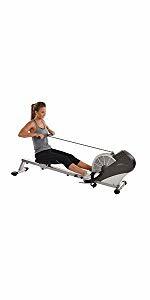 You get a better workout by rowing harder/faster.) 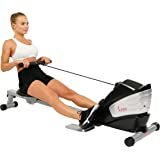 I highly recommend this rower for a home gym. — Jen G.